You can hook up your existing Desk.com account to power your knowledge base and support system in elevio. Once your account is connected, you can give your users an easy way to view your entire knowledge base from anywhere on your site, or submit and reply to any of their support tickets right from the elevio Assistant. First up, head to the connections page and select Desk.com from the available options. Enter your Desk.com domain in the field and click on the 'Save & Connect' button to start the integration. 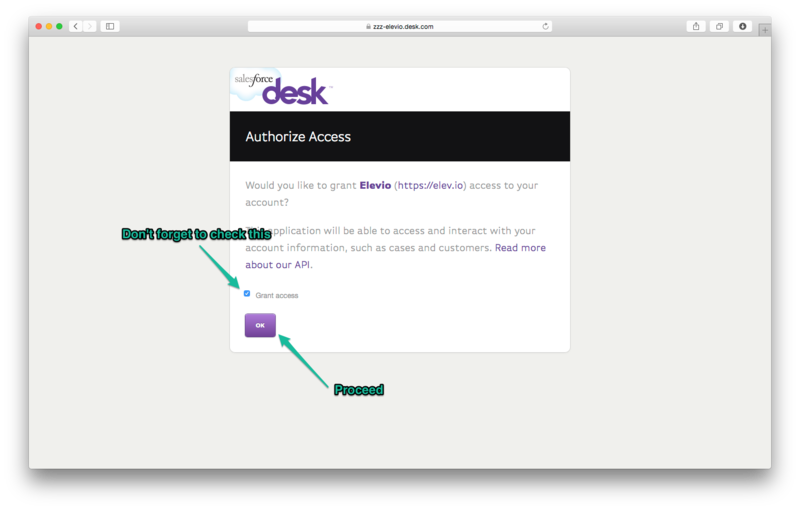 You'll be asked to verify access for elevio to connect to your account, so we can do things like sync your articles, and also send and view support tickets. Check the 'Grant access' checkbox, and hit OK to create the connection. Once the connection is made, you can request a sync of your content, or setup the support module to allow your customers to create, view, and reply to tickets right from within your app.